I love to read books with my children. Our bedtime routine always includes at least one story, sometimes three. Some of our recent book favorites I have shared here. We make regular trips to the library (every 1-2 weeks), and I am constantly on the lookout for great new books to share with my daughters. One of the tools I have been using lately to find good books is the Read Aloud America Book List. The list makes it easy to find great books appropriate at every age level. 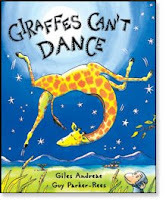 One recommendation we enjoyed was Giraffes Can’t Dance, by Giles Andreae. You can also find some great reads among the Caldecott Medal Winners and Honor Books. An oldie but goodie is Make Way for Ducklings, by Robert McCloskey. It won the award in 1942, and is a favorite on our library check out list. So, what childrens books are you reading?